Yeah, you read that correctly. Hi! My name is Delainie, and I’m the Social Media Director at Drifter Coffee. Pretty soon, that title will also include Events. I began working for Drifter in July 2017 as a barista, and I’ve been running the majority of our socials since June 2018. I’m sure your wheels are turning and you’re thinking, “Wait… Alleah doesn’t post all of the pictures? Is she even the person replying to my comments?” The truth is— it’s one big ol’ collaboration between myself, Alleah, and our Creative Director, Amelia, to operate Drifter’s social accounts. Wayne State Farmers Market 2018. Along with Drifter’s success (thanks to you!) came a crazy girl boss lifestyle, and Alleah knew the online marketing would fall short unless someone else helped out. Luckily, I’m a year out from receiving my degree in Broadcast Journalism and New Media from Wayne State University, which means I’m a Communications nerd with a minor in online marketing and social media. Long story short, my job includes conceptualizing and creating content, maintaining online communications, and executing online marketing campaigns. In more basic terms, I make sure our social media and website is *aesthetically pleasing*, promote the brand, and keep in touch with the community. So the answer is: you likely talk to both myself and Alleah when you’re commenting back and forth with Drifter Coffee! It’s been an honor that we’ve started receiving so many questions from the community about starting small businesses. You’ve probably read some of Alleah’s posts about what it’s like to be a business owner, and I know she has more in-depth blogs coming soon. In the meantime, I’ve created a basic outline of how I’ve been working to improve our social media presence. Online marketing is one of the most important parts of founding a small business, so buckle up! Switching gears to the online and new media landscape is one heck of a trip when you’re trying to establish branding, gain loyal customers, and market your business. We have always been an interesting case because we’ve been operating out of our famous little blue trailer for nearly four years, meaning social media is our main line of regular communication with the community. Why so much focus on the community? Because if you don’t build a fluid relationship between you and your followers, they have no sense of loyalty to your business. That’s the difference between our community choosing to visit our coffee shop in the morning rather than a corporate shop. Our little blue coffee caboose. 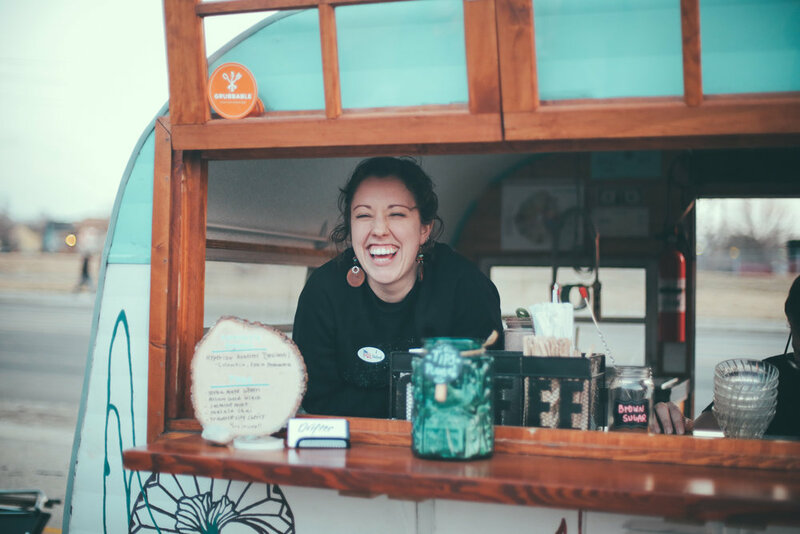 It’s a 1971 Serro Scotty trailer that our Head Honcho, Alleah, bought on Craigslist and transformed into a mobile coffee shop with her dad. Inevitably, that teal color (its HEX is #83d0db if you were wondering) became Drifter’s brand color. Free Coffee Friday, Summer 2018. When I began working on our socials and branding, I knew I wanted to create a photo filter and introduce more signature colors. Alleah requested that our content portray “70s sunshine,” thus leading to the bright, yet vintage-inspired filter we use on our photos today. We also introduced a millennial pink (HEX #f3cfdb) to our branding. Brand colors are ideal for creating logos, merchandise, or choosing paint colors for your coffee shop (wink wink), but your socials can be more focused on your aesthetic! For example, our aesthetic is a mix of 70s sunshine, community, girl power, and coffee. Drifter’s content features elements of teal and millennial pink, but not exclusively. Designed by Amelia Eramya (2019). It’s easy to get caught up in brand identity, which comes in to play particularly with graphic design. Our Creative Director, Amelia, typically tries to include our teal and pink colors, but she also experiments with the whole damn rainbow. This works perfectly though, because our aesthetic is thematically free-spirited and bright. If your aesthetic is monochrome, however, that would mean that your brand colors and aesthetic are directly related. That’s great, too! Just know the difference and delegate which projects revolve around aesthetics and which revolve around brand colors. This is an idea that spans across nearly all fields of communication, and it’s also my favorite. Humanization is transforming the stone cold objectives of business by introducing the actual people behind the scenes. Somehow this is the most simple, yet it gets forgotten when brands focus too much on creating marketing content. It’s used more often than you might realize— especially in commercials and non-profit marketing. Think about it. Would you be more likely to donate to a charity that’s all logos and numbers or a charity that shows photos of the people your money is helping? UNICEF does a great job of humanization. The same thing goes with us at Drifter and any other small business. We could post the a million of most aesthetically pleasing flatlay latte art photos, and I can guarantee you’d get sick of it and eventually stop interacting with our posts. So instead, our grid features an even mix of coffee content and real human people! Instagram gridding tip: Checkerboard your content for a pleasing photo feed! Meaning, use alternation of content style. This is most commonly done using colors (like black and white on a checkerboard) or subject matter (picture of a person, picture of a coffee, picture of a person, and repeat). I especially work to grid a mix of humans: our owner, employees, customers, and community partners. By adding these faces to the mix of content on our pages, our followers have an increased sense of relationship toward our brand; the people associated with Drifter are relatable! (Really, it’s not fake— We’re all pretty chilled out). Our humanization also shows through the casual language in our captions and use of emojis. I’m not going to lie. Algorithms are annoying. Social media users (myself included) follow hundreds upon hundreds of accounts. To combat the seemingly endless amounts of content on your feed, platforms like Facebook and Instagram use algorithms to decide which posts you see first and which get pushed to the bottom. This is great in the sense that users are no longer overwhelmed with content, but it’s a death sentence for accounts trying to reach their entire audience. And to make matters worse, platforms are constantly changing their algorithms, making it nearly impossible for businesses like Drifter to keep up. I won’t go in to detail about the various algorithms because they’re complicated and my explanation would be outdated soon anyways, but just know that much less people see your posts than your total number of followers. How do we try to fight the algorithms? Find your best posting time. There are articles and theories about what days and times are best to post on the various platforms, but every audience is different. Our posts reach the most people on weekday evenings, so we like to post Monday-Friday around 7pm. You can track your insights by switching to a business account or using third-parties like SproutSocial. Promote engagement. Over time, we’ve found that our followers enjoy photos of our coffee shop, giveaways, and inspirational graphics. When we share these types of posts, more people tend to like and comment, which then tells Instagram and Facebook to show the posts to more of our followers. Be consistent! Don’t post a million times per week, but finding a good flow is important. Generally speaking, posting 1-3 times per day is optimal. Like I said, we typically post once per day Monday-Friday, and occasionally on the weekends. The best thing you can do is not let the algorithm discourage you. Some days will be great, and other days, your efforts will seem pointless. It might seem like social media giants receive bountiful likes, but Kylie Jenner’s latest Instagram picture with Travis Scott? It received about 5.9 million likes. That’s only 4.7 percent of her 125 million follower count. You’re probably doing better than you think. The best way to find your online community and build a brand is through experimentation. Gaining a loyal following takes time, and you have to learn about your followers before you can post the most effective content! Try posting at different times of the day with various content types. Be patient, and that community will develop. You can also be more direct by asking your followers what they want! We do this all the time via photo captions and Instagram stories. There’s even a sticker you can post on your story that allows viewers to respond to your questions or polls. Also, consider a brand hashtag such as #driftercoffee. This will help you accumulate something us media nerds call “user-generated content,” which basically means your followers are posting material about your brand. This is the ultimate community-building tool! It creates a seamless conversation between your brand and your followers, just like a chat around the dinner table. Are you freaking out yet?! That’s okay. I do, too… like all the time. It truthfully is a lot to balance, and this is only the tip of the iceberg. I’ve been working for Drifter Coffee for nearly nine months, and I’m still figuring out the flow for this audience. Branding, aesthetics, and the algorithm tend to be the three main topics people ask me about, and humanization and crowdsourcing are my two favorite communications tactics. That said, you can Google these ideas and find tons of other articles with opinions about the “right way” to operate social media. I’ve taken those into consideration when strategizing for Drifter, but the greatest tool has been trial and error. The success of a community donation drive online campaign. Thanks, friends! Our shop opens so soon, and I hope to be leading workshops all about social media and online marketing. Until then, this should get you started! You can leave your comments and questions down below or on our socials, and look for another blog (perhaps about being a creative and graphic design) soon. Happy posting! Hi! I'm Alleah and I am the owner of Drifter Coffee. Thanks for visiting my blog! Here I will share updates on our upcoming shop, coffee findings and thoughts on cool topics like community, entrepreneurship and of course, coffee. *Please no trolls. We are all nice humans here.